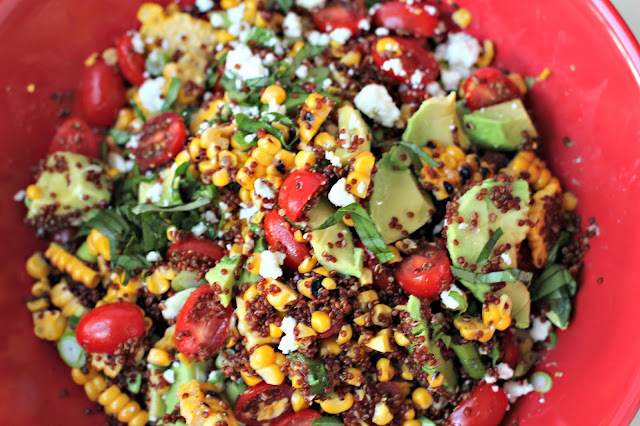 I ate my way to the bottom of a huge bowl of this salad, leaving no room for cake. It's a tragedy and a comedy all in one. Put the olive oil and lime juice into a small bowl and whisk. Season with salt and pepper. 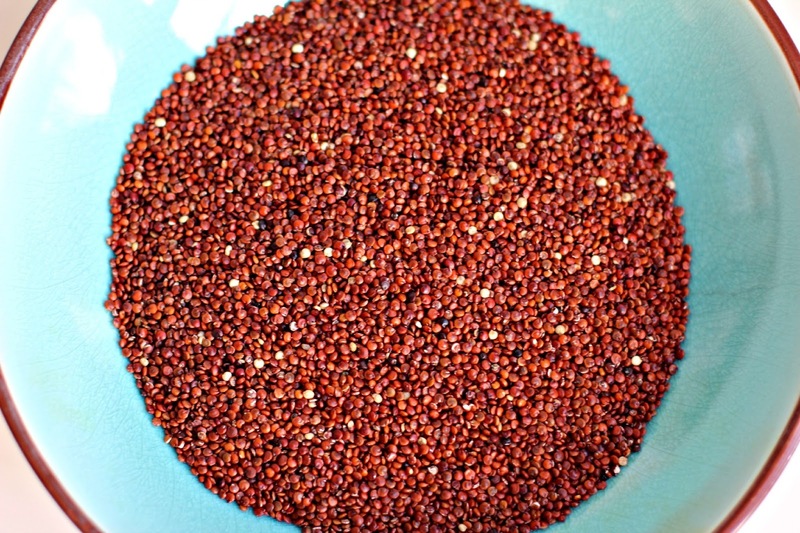 Rinse the quinoa in warm water and drain. Bring 2 cups of water to a boil in a small saucepan and add the quinoa. Bring the water back to the boil and then reduce the heat to medium - a lively simmer. 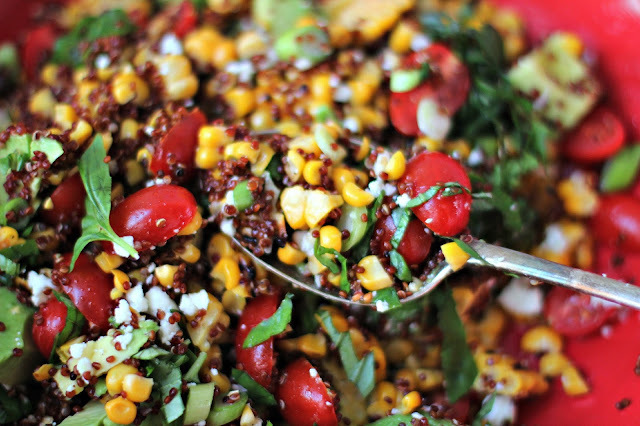 Clamp a lid on the saucepan and cook with quinoa for about 12 minutes. The water should be all absorbed. Turn the heat off, fluff the quinoa with a fork, pop the lid back on and let is rest for about 15 minutes. 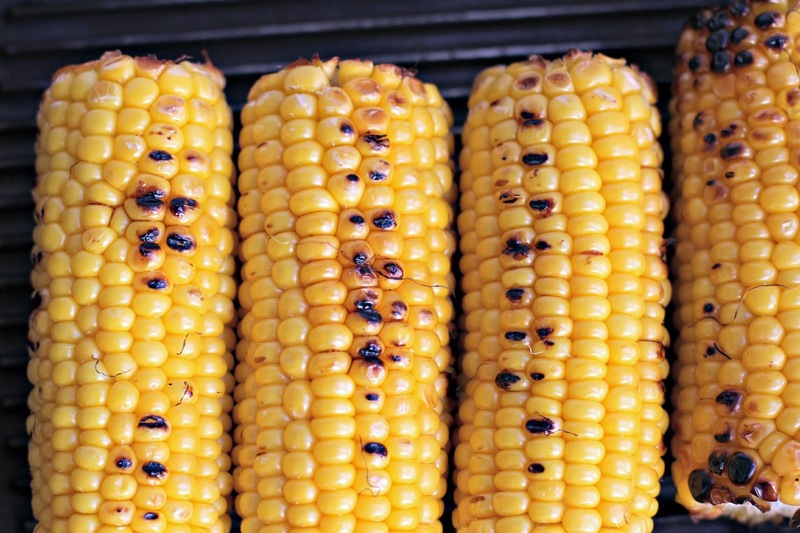 Grill the corn on a grill pan or barbecue until it is cooked and lightly burnished. Cut the kernels off the cobs. 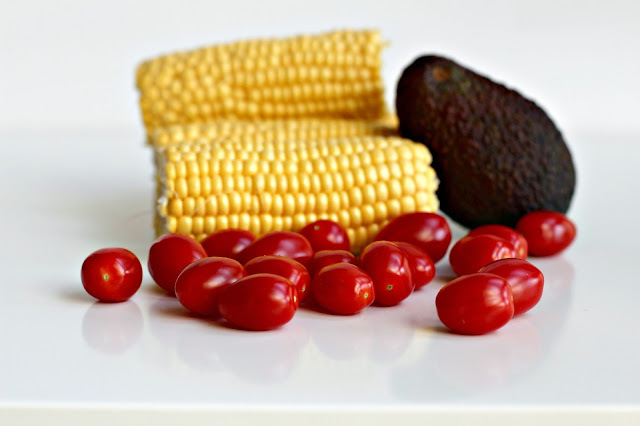 Put the cooked quinoa, grilled corn and tomatoes in a large serving bowl and season well with salt and pepper and toss. Add the avocado, spring onions and then the dressing and toss again. Top with crumbled feta and shredded basil leaves. This incorporates all the flavors I love most - yum! This looks so yummy! So colorful and summer-y. :) I love it. This salad looks amazing. 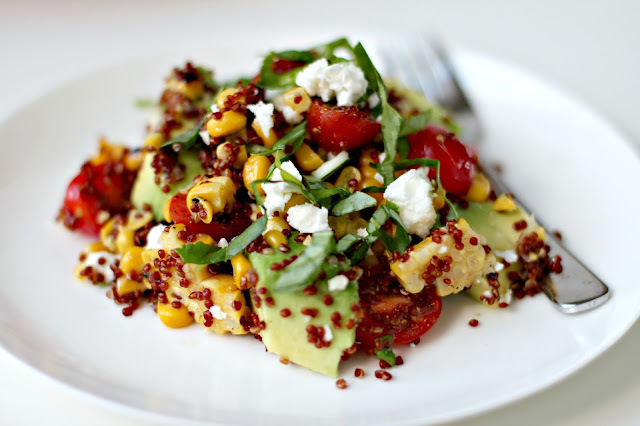 But what are quinoa exactly? P.s thanks for the coffee cupcake Jen. Me too Jessica. Can't get enough of the stuff. Thanks Abbie. I always think "the more colours, the better it must before for me", including ice cream! Hey Sam, quinoa is a seed from a grass crop. I sometimes use it in place of rice or couscous, or to add bulk to a meal instead of using pasta or potatoes. 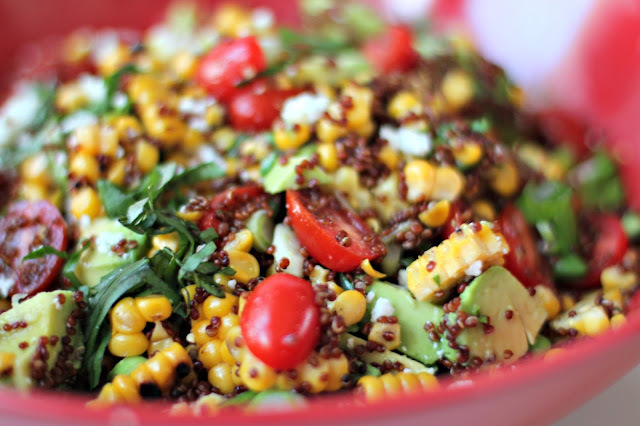 There's white quinoa, red quinoa and black quinoa. Red is my favourite, but you can generally use them interchangeably. 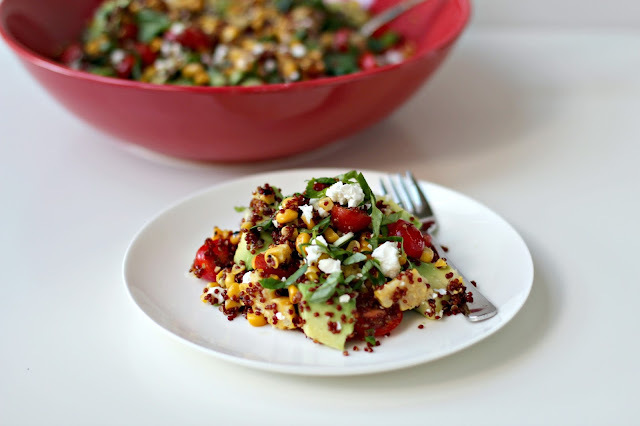 This corn salad looks so fresh and summery and just ove the vibrant colors! @Judit + Corina - thanks for stopping by. Healthy too Angela - gotta love that. This recipe has been very popular with the readers Jen, thank you so much ! Thank YOU Lea. That makes me very happy.